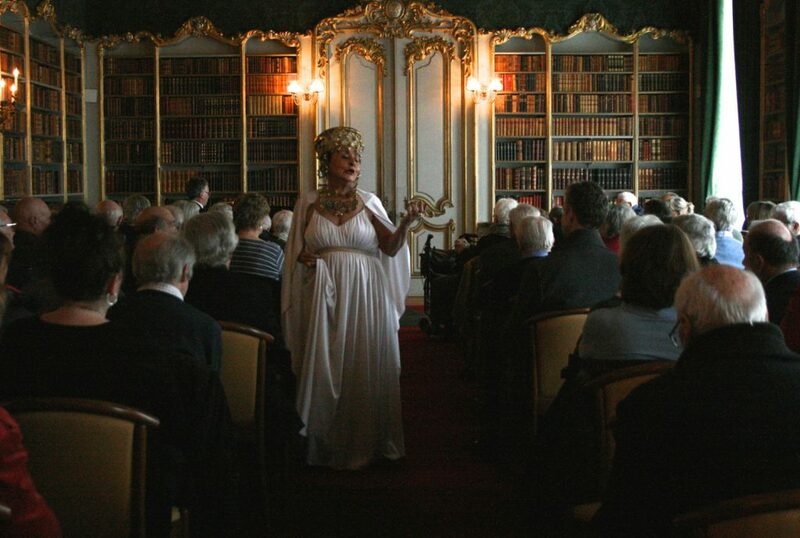 “Thank you so much for once again providing such a unique and wonderful afternoon yesterday at beautiful Wrest Park. Our 48 attendees from Tibbs Dementia Foundation had a fantastic afternoon. The atmosphere was so relaxed and welcoming, the content of the concert perfect in length, content, pace and you are all such brilliant performers. For people with dementia and their families this was a real treat, an informal setting but the opportunity to experience quality music and a professional performance. We all felt very special and pampered. In 2014/15, Arts Council England (Grants for the Arts) awarded us £14,700 in a one-year study of the effects of repeated performances with the same groups of dementia patients. 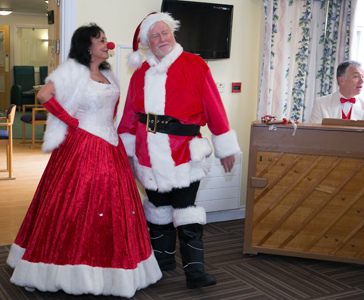 Quantum Care Homes in Hertfordshire, Bedfordshire and Essex collaborated in this project which involved performing a total of 42 concerts – 7 in each of 6 selected homes where residents primarily suffered dementia to some degree. The concerts were themed according to the season of year and major events occurring at the time, with songs, music and elaborate costumes appropriate to each theme. Care home staff were most helpful in completing a monitoring questionnaire which was designed to help us evaluate the impact of this sustained intervention. The project was deemed to be successful in the sense that the outcome were achieved almost immediately and staff felt that residents were becoming progressively familiar and comfortable with our visits. In 2018 we were awarded £7,350 by the Cloudesley Foundation to conduct a similar project with older people in their Islington area of benefit who were suffering dementia. 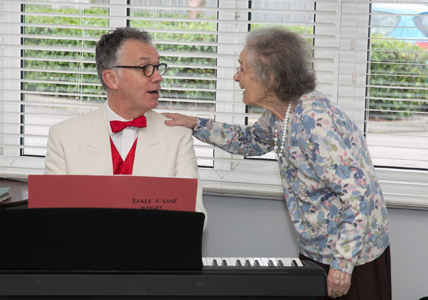 The project was titled Music in Mind and was a sustained intervention of four differently themed concerts in 5 chosen venues (both Care Homes and Day Centres). Evaluations were made using the same questionnaire as for the Quantum project, with the cooperation of Events Managers and other staff. 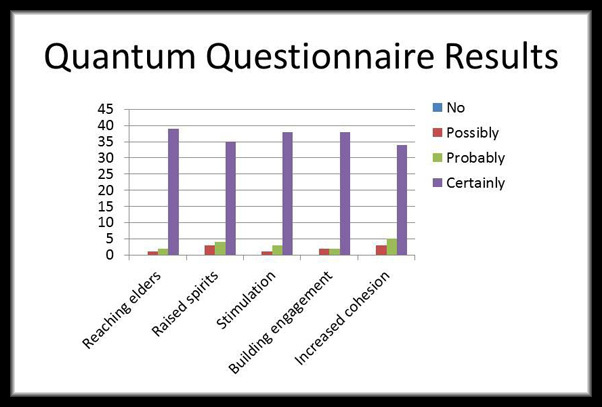 The outcome was similar to the Quantum study but even more strikingly – rapport was virtually immediate and there was a consensus that the reminiscence provided by the music was highly beneficial to the residents. No ratings of less than “Certainly” were recorded for any the 5 outcome criteria. Apart from seasonal relevance, there were exciting costumes changes and continuity provided with informal introductions to each item and amusing historical anecdotes, which added to the interest for audiences. Themes were as follows: The Fabulous 50s (Oct/Nov 2017, Winter Wonderland (Dec 2017), We’ll Gather Lilacs (March 2018), Bless Em All: Edwardian songs to mark the WW1 Armistice (June 2018). Several staff members reported that their clients would become animated and sing along or get up to dance, to a degree they said, that they had never observed before. One Centenarian (called Jim) was quoted as exclaiming “Gosh, that takes me back”. Others said how grateful they were to have a show of this quality and colourful costumes brought in to where they lived or met. Many who had initially seemed distressed and insisted that they did not wish to attend the concert or “wanted to go home” were observed to have been soothed by the music and were now happy with their environment. In one day centre, the pianist noticed that as he played a solo, a lady in the audience was moving her fingers as if she herself were playing. He spoke with her later and discovered that she had indeed achieved quite a high level of proficiency as a pianist but said “my fingers are too stiff now”. A lady called Bonnie became very animated when the pianist played a medley of Glenn Miller favourties. She excitedly told us that she had heard Glenn Miller himself play live on a boat trip when she was younger. At St Anne’s Care Home there was a fidgety and rather violent patient who appeared to become content and calm as the concert progressed. By the end, he was totally calm, smiling warmly and gently holding the singer’s hand.